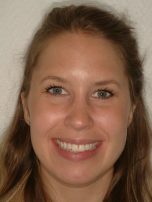 Emma came to see me in May 2016 for a consultation regarding improving the appearance of her teeth. 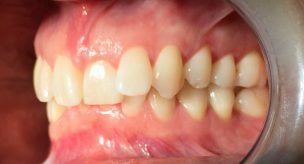 She reported a history of previous orthodontic treatment in her teens which had relapsed and led to minor crowding of the upper and lower arches. 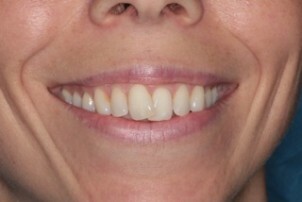 He main concern was the ‘crowded and crooked’ appearance of her upper front teeth. 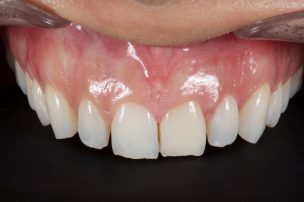 A full series of photographs were recorded as per the IAS protocol and measurements made of the widths of the upper teeth using digital calipers. This information was used to digitally plan the case using the SpaceWize software. 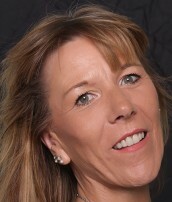 All options for orthodontic treatment were discussed including fixed appliance treatment by a specialist orthodontist. 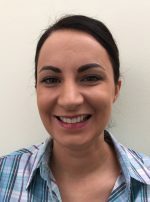 Emma was not keen on undergoing fixed appliance therapy and preferred the flexibility of wearing a removable Inman Aligner appliance as it was better suited to her busy working lifestyle. Valid written consent was obtained after discussed all risks, benefits, advantages and alternatives. The IAS Consent forms for Inman Aligner are a fantastic resource and allowed me to have comprehensive discussion with Emma about the specific risks of having treatment. 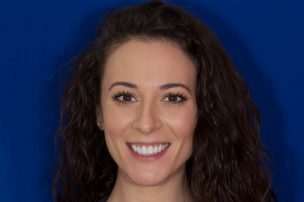 Accurate PVS impressions in rimlock trays and a CR bite registration was recorded and a prescription requesting a ‘Standard Inman Aligner’ with a plan of the proposed tooth movements sent to Nimro Dental in London. The Appliance was fitted after 2 weeks as requested in June 2016. 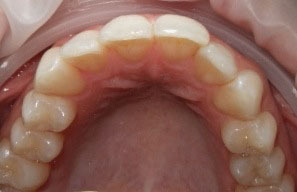 The first composite anchors were placed on the most ‘in standing’ teeth UR1 and UR2. 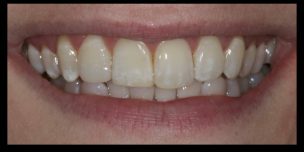 Space was created between the teeth at each 2 week appointment using graduated IPR strips and PPR was carried out where needed with sofflex discs. PPR was important to progress this case as it allowed more efficient alignment of any crowded contacts. Topical fluoride was applied to the surfaces all teeth where IPR was carried out and oral hygiene reinforced at each appointment. The total treatment time was 14 weeks. 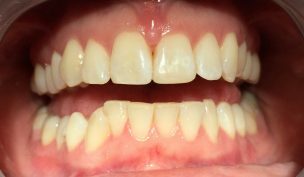 At the end of treatment a bonded palatal retainer was provided with a clear essix for night time wear. 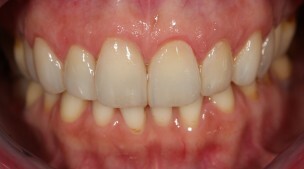 2 weeks of external vital bleaching was also carried out using 10% Carbamide Peroxide in close fitting trays. The final cosmetic improvement was done by providing composite bonding to the UR2 and UL1 to improve the proportions of previously worn and chipped edges. I have been a certified provider of the Inman Aligner since 2015. I found the hands on course very accessible with excellent teaching and demos on the IPR and PPR techniques. 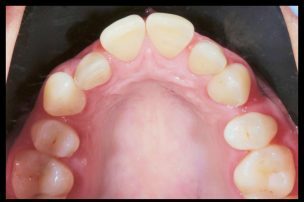 As a complete beginner to anterior alignment orthodontics I found it reassuring that the IAS ethos placed heavy emphasis on comprehensive orthodontic examination and appropriate case selection. The IAS Inman Aligner forum is a fantastic resource for all GDPs providing this treatment. The one to one support provided online by the team of mentors is always excellent and very prompt. The forum is regularly checked to ensure all members are well supported and no posts go missed. 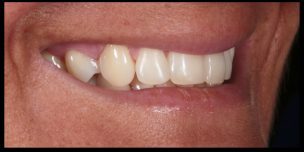 I am a great supporter of the IAS Inman Aligner and truly feel it has given me a new outlook to approaching anterior cases. 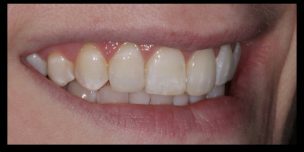 The ability to predictably improve the position of any crowded or retruded anterior teeth allows me to provide minimally invasive solutions in ortho-restorative cases which would have otherwise required heavy preparations for crowns/veneers. I would recommend the IAS Inman Aligner Accreditation course to colleagues who are considering starting their anterior alignment journey as the support and teaching is in a league of its own ! 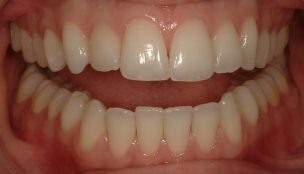 ‘’After having braces as a teenager, I was really unhappy when my upper teeth started gradually moving, giving them a very crooked appearance. 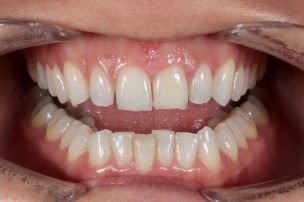 When I saw the advertisement for the Inman Aligner, and having talked it through with Salman, I couldn't believe how easy and quick it all sounded and I decided to proceed with the treatment. 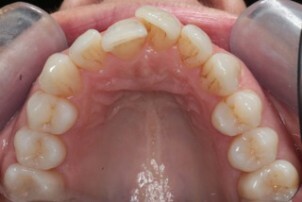 Woman 28, she had ortho for 5 years earlier without getting retention after treatment. She observed that it has been increasingly crowded in the lower but also in the upper. She has seen that especially right lateral has moved facially. Skeletal class 1, Face height average, Molar right and left side; class 1, canine right side 1/4 class 2, left side class 1, lower midline deviation approx. 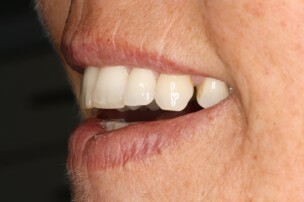 2 mm to the right, she is not bothered by the midline deviation, she notices increasingly open bite between upper right lateral and lower right lateral/canine. She was informed about all options also referral to orthodontist which she declined. 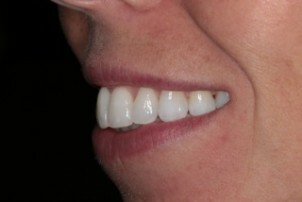 We used Inman aligner in the lower and clear aligners in the upper. Treatment time was 4 months. Here, Dr. Alexander Herz, a practice owner and dentist in Vechta, Germany, outlines a case using the ClearSmile Inman Aligner. Dr Herz has been a certified user of the appliance since 2014. 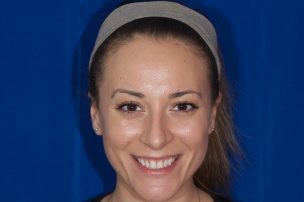 I first heard about the ClearSmile Inman Aligner from Michael Nix, one of IAS Academy’s German trainers, which led me to take the course – since then, I have become an extremely enthusiastic user! 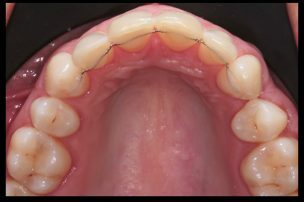 For anterior crowding or protrusion, I find this particular solution to be a great minimally invasive treatment, one that allows me to treat a number of simple to moderate cases. In comparison to the cases that I took on in the following months after I became a certified user of the IAS Academy appliance, I am able to address much more complex alignment issues. This is made all the much easier thanks to the outstanding support that is available from the online platform. 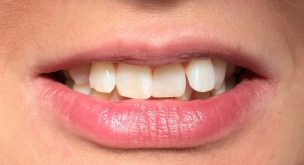 One of my most recent cases was a 31-year-old female who presented to my practice having been recommended by her brother-in-law, whom I had previously treated with an aligner with successful results. Medically, her records indicated nothing untoward, while her dental records revealed that she had undergone previous orthodontic treatment during childhood. 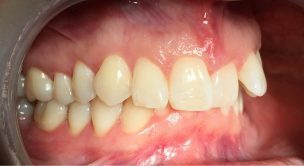 Due to failed retention, the patient had become dissatisfied with the position of her upper anterior teeth. The clinical examination revealed misalignment in the lower arch too, but at this time the patient wished to focus on the uppers only. It was explained to her that a much more stable and accurate result could be achieved should she agree to undergo treatment on both arches simultaneously, but it was her intention that we simply monitor and reassess in the future. After the regular dental examination, impressions of the upper and lower arches were taken as well as X-Rays of the anterior teeth. During the digital case planning, the Spacewize+™ arch evaluation software estimated that roughly 1.8 mm of space would be needed to achieve the intended outcome. This was later confirmed as 2.2mm by the lab. 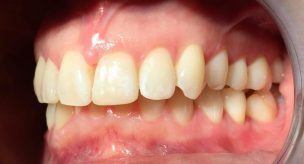 Digital images also revealed the extent of malocclusion in UR1, but as planning indicated the alignment of UR2 would create some space, there were no concerns about the result. 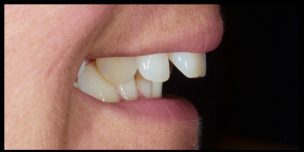 The only other concern at this point was whether the patient’s deep bite would leave enough room for the placement of the retainer. 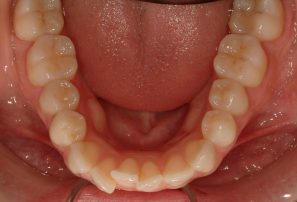 Just in case, it was explained to her that implementing the Dahl principle might be a possibility if problems occurred with positioning the retainer after alignment treatment was complete. To give the patient an idea of what the final result would look like, we had a digital mock up done, which she said was extremely helpful. 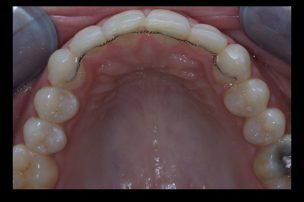 Overall, both the patient and myself are very happy with the final result, though, of course, the preferred outcome would have been to align the lower arch too. As of yet, the patient has not made her decision regarding the treatment of the lower anterior teeth. As such, I have suggested that she uses a retainer to prevent any further relapse. The ClearSmile Inman Aligner course is part of the IAS Academy pathway of training for GDPs. The course is now a continuum and 2 cases must be submitted and evaluated on completion for website listing. 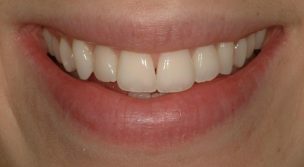 My first Inman Aligner case involved a young female patient who wanted to correct a mild alignment issue before her wedding. 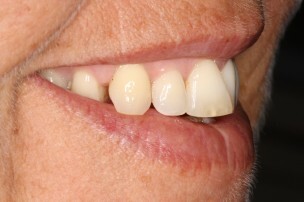 Her main complaint was the slightly protruding upper left central incisor. The mild crowding of the lower anterior teeth did not concern her. 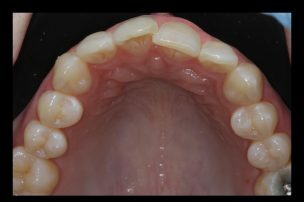 The posterior occlusion was stable with a class 1 molar relationship and canine guidance and there was no history of parafunction or cusp fractures. Spacewize analysis showed approximately 1.6mm of space would need to be created by interproximal reduction (IPR) in order to align the teeth. 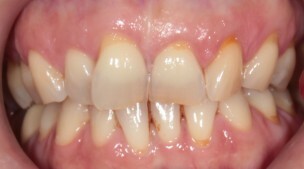 Considering the beauty of the unrestored anterior teeth and the minimal amount of tooth preparation required in this case, the patient and I agreed that orthodontic alignment and some tooth whitening would be preferable to more extensive restorative approaches such as direct or indirect veneers. 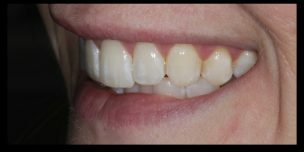 After posting the initial photographs on the online forum and receiving advice from two IAS academy mentors, a full treatment plan and 3D printed models of the potential end result were requested from the lab along with the Inman Aligner itself. 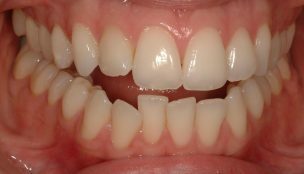 At the fit appointment, a small amount of IPR was performed and the patient was instructed to wear the aligner for around 20 hours per day, removing it to eat and brush. After just 10 days she returned with a noticeable improvement and subsequent rounds of photographs and IPR were posted on the forum every two weeks until the case was complete. 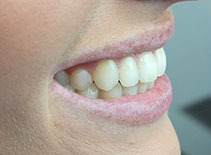 In total she wore the Aligner for 10 weeks before a fixed retention wire was placed and was delighted with her results! 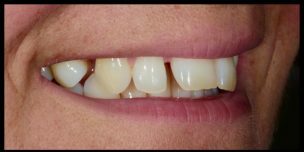 Looking back at the case, I realise the importance of consistent positioning for clinical photographs, particularly the occlusal mirror shots. I could have displayed the final results more effectively with a little more care when positioning the mirror. 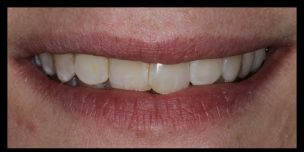 In an ideal world we would also have aligned the very slightly crowded lower incisors before they can move any further & require more extensive IPR, but this was not her primary concern and can be addressed at another time. The support and guidance from the IAS academy mentors on the online forum throughout the case was fantastic and the speed of tooth movements with the Inman Aligner far exceeded my expectations. The patient has all her life been bothered by her smile. She said to me she didn't want to smile, because she was embarrassed by her teeth. 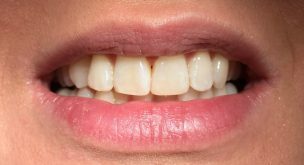 Her main concern was her upper left central incisor which was positioned far labially in the arch, but ideally she wanted all the front teeth straightened. She had heard about Inman, and didn’t want fixed braces, so she asked me if it could be addressed. After measuring the width of the central incisor, I plotted the numbers in Spazewize, which confirmed that this was a possible case. Afterwards I posted the pictures on the forum and got some good tips there. The mentors told me to inform the patient thoroughly the things we couldn’t address. I informed her that we would not correct her over-jet with Inman, but she didn’t mind this at all. She just wanted her smile to improve. So we ended up ordering an Inman with combined expander. I got the aligner back from the lab, and had the patient in for seating the IA. Everything fitted well, and I performed IPR and PPR as prescribed. I informed the patient how to use the expander, and how often to turn the screw, also that she could experience some slight discomfort in the following days. She was very motivated for the treatment, and I had a good feeling this would be a nice case. So after performing progressive IPR/PPR for every visit, we got the result we wanted. 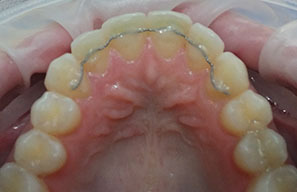 Impressions was taken and sent to the lab for making a fixed bonded wire retainer. While we waited for the lab to make the wire, bleaching trays were made, and she bleached during the hours she was not using the IA. This was really the frosting on the cake for this case. 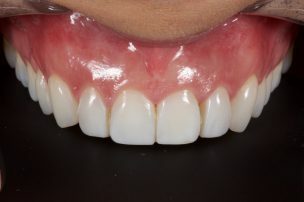 When the retainer came back, this was easily fitted and bonded with flowable composite. 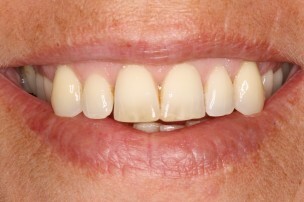 This patient was extremely happy with the result to say the least. After all these years, she finally can smile without hiding her teeth. Now she smiles all the time! This case was really rewarding for me too, it’s nice to help someone get the smile they want, and at the same time in a conservative way. 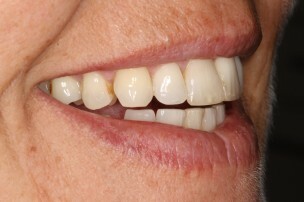 Align Bleach Bond is a fantastic way of doing minimally invasive dentistry. 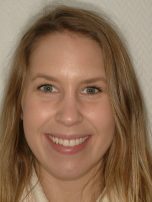 •	Started Fredrikstad Private Tannhelsesenter in 2010,together with Dr.Kai Hannestad, a mixed private dental office with specialized and general dentists. •	Lecturing aesthetic composite classes and workshops in Norway. •	Shows a lot of her upper teeth when smiling. •	Not happy with her upper front teeth and smile. 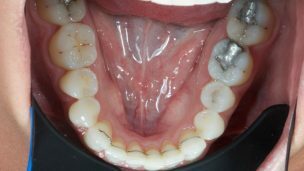 •	UR1 tipped mesial over UL1, that is palatinal in the bow. 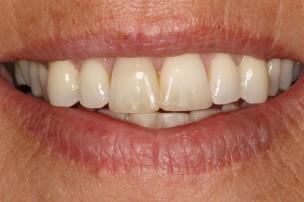 •	Inman Aligner was chosen because of the fast treatment time. 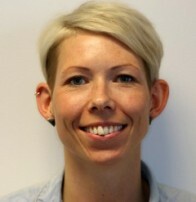 •	Planned the treatment with Spacewize and digital SetUp from Esbjerg lab. •	When UL1 was aligned out in the bow, buccal buttons was placed . 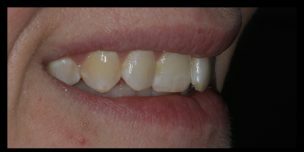 •	Bleaching with White Dental beauty 30 min for 7 day very happy s the last period of the treatment. •	Total treatment time ended at 12 weeks. 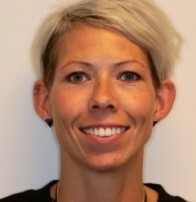 Kelly qualified from Guy's, King's and St Thomas' in 2003. 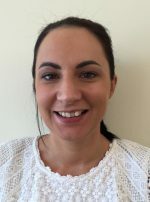 She is currently working as an associate at Regency Dental, Swanage and has been a member of the IAS Academy since completing here initial training in 2015. A 48-year-old female patient was referred to me by a colleague in-house. 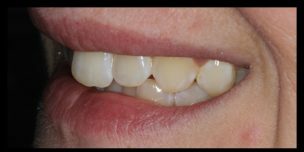 She was unhappy with the appearance of her rotated upper centrals and misaligned lower incisors as they were difficult to clean and kept getting stained. 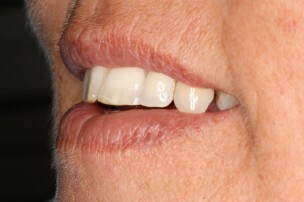 She had been considering veneers when she saw information on the IAS Inman Aligner in the waiting room. 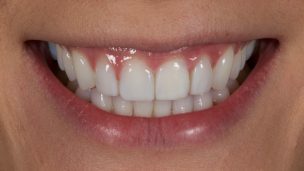 With very little dental history, no restorations and a regular attender to the dentist and hygienist, the patient was medically fit and well. 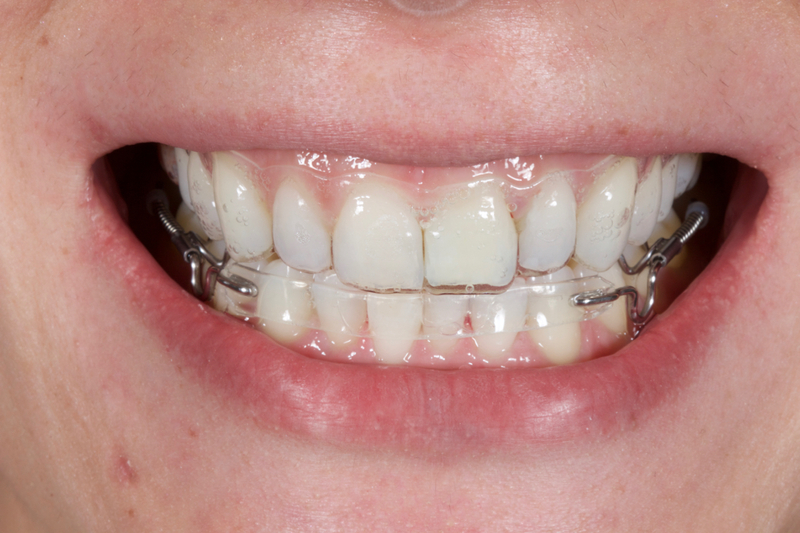 A thorough orthodontic assessment revealed a Class I occlusion on a Class I skeletal base. 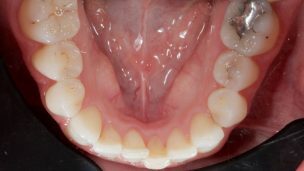 There was mild crowding in the upper and lower labial segments, the upper centrals were rotated and the upper canines buccally placed with space distal to these. Periapical radiographs taken of the anterior teeth were clear. The treatment options available were discussed with the patient in detail. 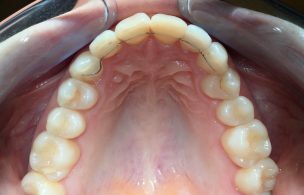 She had already spoken to a specialist orthodontist regarding fixed braces, but the cost and the thought of the suggested four extractions proved inhibitory. My colleague had discussed veneers / crowns and the biological risk to these unrestored teeth, plus the possible aesthetic consequences. 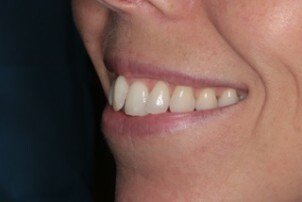 The patient was keen on the IAS Inman Aligner as it could be removed to eat or for special occasions. 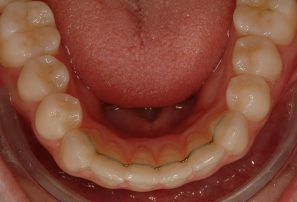 The possibility of whitening and edge bonding were also discussed as part of the ABB (Align, Bleach and Bond) approach. 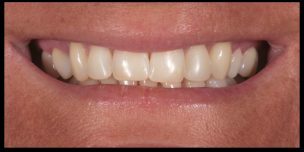 A full set of photographs were taken and Spacewize+™ arch evaluation software employed to determine the amount crowding present and the ideal tooth positions using the upper laterals and the LL1 as the landmark teeth. 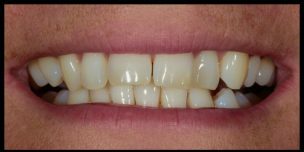 Silicon impressions were sent to Nimrodental for a diagnostic set up to ensure the patient was happy with the final smile before the appliances were made and treatment commenced. She was advised that the upper canines would not be moved with this appliance. The patient was happy and full valid consent was obtained. Treatment began on the lower jaw. The appliance was checked for fit and the patient was shown how to place and remove it. Interproximal reduction (IPR) was carried out from canine to canine as per lab instructions and predictive proximal reduction (PPR) performed on the mesial aspect of both lower laterals. Composite anchors were placed on the lingual aspect of LR1 and LL2. At the first review appointment further IPR was carried out and composite anchors placed on the buccal aspect of LL1 and LR2. The lingual anchor was removed from LR1 and placed on the disto-lingual of LR2. 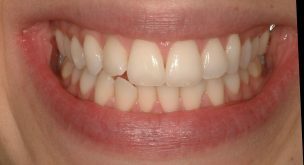 By the next appointment the teeth were aligned and impressions were taken for a fixed retainer. This was bonded with Venus Diamond flow two weeks later. In the meantime, the patient was keen to start with the upper jaw and actually wore the two appliances at the same time for two weeks. Again the fit was checked, a composite anchor placed palatally on UL1, IPR carried out as per lab instructions and PPR on the UR1 mesially. At the first review appointment the patient mentioned that the UR1 had become quite painful and she’d needed pain relief. In a previous de-rotation case another patient had experienced similar problems that eased after a few days, so this patient was reassured that it should pass. The IAS support forum was consulted and one of the mentors noticed that UR1 looked slightly greyish in comparison to UL1. The tooth was vitality tested and it had become devitalised. 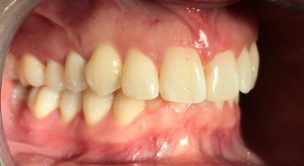 The possible reasons and causes were discussed with the patient and it was thought that perhaps past trauma to the tooth had made it susceptible to devitalisation. Treatment was halted and an Essix retainer was made while root canal treatment was carried out, uneventfully. Once she was pain-free the patient was keen to continue alignment. IPR was performed from 3-3. 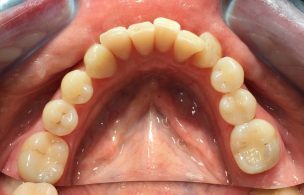 At the second review, the patient reported no further problems so buccal anchors were placed on both central incisors mesially and the palatal anchor was removed from UL1. 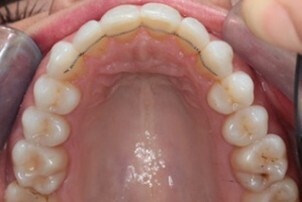 The labial bow was later tightened by adding composite to the springs. I’d received some useful advice from other dentists on the IAS forum with regards to lightening the UR1 and impressions were taken for bleaching trays. The temporary filling and some GP were removed one week later from UR1 and a GIC plug was placed at the neck of the tooth. 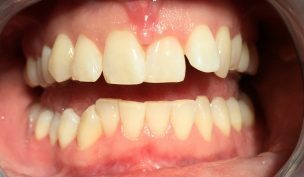 The patient was shown how to place the bleach in the palatal cavity of UR1 with the tray over the top and advised to do 45mins twice daily. 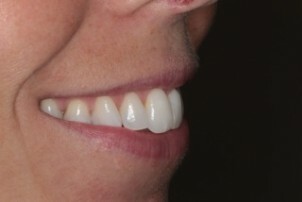 One week later the shade of UR1 had improved and the patient started whitening the remainder of the teeth. 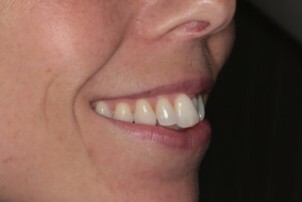 Impressions were also taken for a temporary Essix retainer and a fixed retainer. 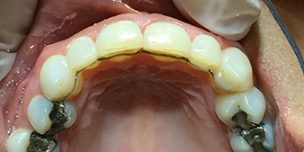 Once the patient was happy with the shade of her teeth we waited two weeks (as bleaching can affect the bond strength of dental adhesives) before fitting the wire retainer, which was fixed with Venus Diamond Flow. 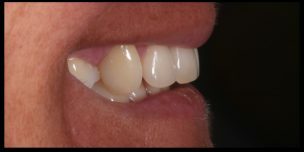 Edge bonding was also performed with Tetric Evoceram to level out the upper centrals. 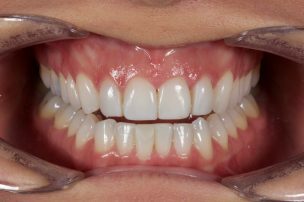 Impressions were taken for final Essix retainers/bleaching trays for optimal retention. 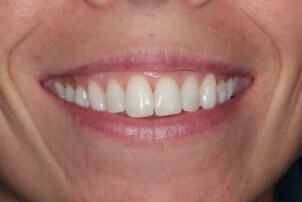 The patient loved the final result, happily showing off her smile as much as possible. 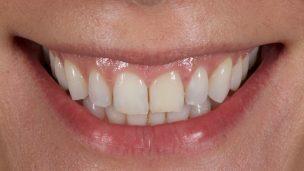 I am pleased with the outcome too – we avoided invasive restorative dentistry and gave the patient something that is easy to maintain long into the future. The UR1 will continue to be monitored and further bleaching carried out if the shade isn’t maintained. This case highlighted for me the importance of going through all the risks associated with any treatment, however rare they may be. The IAS Academy mentors had never seen a tooth devitalise using the IAS Inman Aligner before, although it is a theoretical risk with any orthodontics. Full documentation including photographs and radiographs before treatment begins, is also a must. I don’t think it would have made any difference to what happened in this case, as it couldn’t have been predicted, but in this time of litigation I know I have all the information to show it was okay to proceed with the case at the time. The support from the forum was invaluable during this time to reassure the patient and I that everything would be fine in the end. 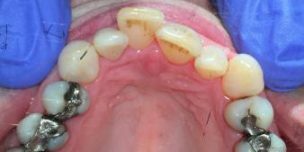 It is an excellent resource and I’m sure other dentists following my case on the forum will also have learnt from my experiences, although I hope this is the first, and last, case of a tooth devitalising during IAS Inman Aligner treatment.